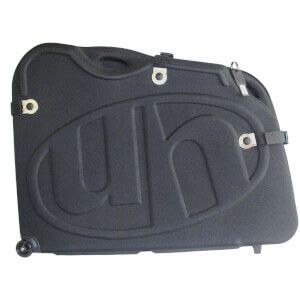 The B&W bike box is a good quality, hard case transport option. Taking my bike overseas for the first time I was a little nervous so wanted the best protection possible. However given the eye watering prices of some hard boxes on the market I had started to despair. I found B&W and snapped one up. It's got my bike safely through the hands of airport handlers both in the UK and Spain. The padding and wheel covers included are great, the only addition I made was to buy some foam pipe covers for the frame and cable ties to secure everything in place (though the integrated straps so a great job too). Great value and well built bike box. It may not be the funkiest looking and is tricky to load the first time but once you get over the looks and get the hang of it, it's a great piece of kit. A snug fit for a 54cm BMC GF01. The frame fits with rear mech still attached, however some cable gymnastics required to get the detached handlebars packed all pretty and flat as per the illustraton without kinking the brake hoses and gear cables. Once the hurdle of packing the bars was overcome, wheels and everything else went in no problem, with space for all of the clothes, shoes, helmet and tools required for my trip. It was easy enough to close and lock the case, and manhandling it to and from taxis was ok courtesy of the well placed handles. The wheels are fixed orientation rather than swivelly caster style, so if you want to change direction you have to either lift the front of the case up and slew sideways, or drag it forcibly, which is a bit annoying for an otherwise quite well designed bit of luggage. Petty moaning aside, and most importantly, the bike and all other contents arrived unscathed. For the money it certainly does the job, and is more compact than square section cases and bags. There are sexier cases out there, however they're around double the price, so in my experience the B&W is a good functional buy. it would get 5 stars but for the non swivelly wheels. a sloping 54cm colnago c56 fits in the box but there is not a lot of wiggle room. i've taken the rear mech off and bars with stem. i have a c260 stem which is horrendous to the get onto the bars so off came the lot. with wheels and frame the box closes easily and the locks align and lock. the mass of it loaded so far with just the full bike is ~ 18.5 kilos and there is room for more stuff eg helmet, travel pump and shoes hopefully. the handles don't look the most robust but they'll need to do. not used the box yet but handles aside i'm pretty confident the bike will be safe and the reviews of the box having been used are favorable. my main worry is getting into my car which is a 3series estate. may have to leave the family behind when it's time to lug the thing down to the airport.